How to Get in the Best Shape of Your Life! SEND ME THE MONDAY MOTIVATIONS! I am a 49-year-old woman with a great husband, kids, and parents, and work. You know, the potential for high stress and busy schedules. I am also in the best shape of my life. I feel great inside and out and I am able to give my best to my family and others. But it wasn’t always that way. It has been a journey and I’ve found balance along the way. “Congratulations, you’re having another girl!” I was 38 and pregnant for the second time in a few short years. Having babies in my late thirties was such a blessing. My husband, Andy, and I were thrilled and could barely contain our excitement! However, with a one year old daughter at home I was exhausted and overwhelmed. How was I going to handle it all? How was I going to successfully raise two girls to become faith-filled, happy, healthy, secure women without losing “me” in the process? Through my sleep-deprived haze I took a good look at myself. The reality was my own body image wasn’t so hot and confidence was lacking. Back-to-back pregnancies, sleepless nights with a toddler, morning sickness and overall fatigue had taken a toll! Michele Lehman shares how to get in the best shape of your life! All the normal questions crossed my mind. Would I ever get back into shape? I really wondered how to get in the best shape of my life... Did I have the discipline to live a sustained, healthy lifestyle? 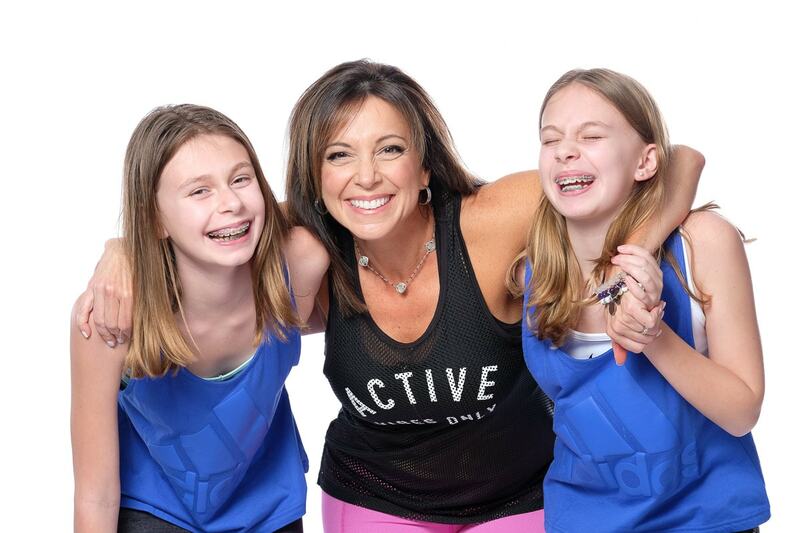 How could I help prevent our girls from suffering body image issues that plague so many women? How was I going to model a healthy lifestyle and positive body image? How could I effectively keep my priorities in line: God, Andy, our children and others? Confronting reality was the first step in my fitness journey. I had always been athletic. Loved sports of all kinds. But Iacked muscle, flexibility and the discipline to consistently eat healthy. My metabolism had also been shot from years of excessive cardio and lack of appropriate calories and nutrition. Things needed to change. I needed to be healthy…physically, spiritually and mentally. For me. For my family. I had no option…. A wonderful trainer named Tina Triguero came into my life after our second daughter was born in 2008. She helped me believe I could do it…eat healthy, gain muscle, lean out, sleep well and have energy. She told me I would one day simply pull a pair of small pants off a rack and buy them without trying them on first. This seemed absolutely crazy at the time. But, I followed her lead, took it day by day, learned my way around the gym and things began to change. Yes, my body changed. But the real change took place inside. I was free….free from doubt, fear and body image issues that had quietly gripped me for a long time. I was committed to doing everything I could to prevent my girls from feeling those insecurities. Fitness certainly runs in this family! Wondering how to get in the best shape of your life? Michele Lehman knows! Then another hurdle. By mid-2015 the demanding schedule of a busy family was making it harder to get to the gym at a specific time. I needed flexibility in my schedule. Seeking other options, I found Julie Lohre and I started working with her in Julie's Online Personal Training for Women program. My goal was to continue to get stronger, more flexible, and make consistent, sustained progress. I loved the fact Julie would do all the “thinking” and I simply needed to execute the plan. I could go to the gym around my family’s schedule and she was only an email away. Julie quickly identified my body’s need for more calories through a wide variety of “good” fats, proteins, complex carbs, vegetables and fruits. Her workouts were designed to help me build muscle and get rid of unwanted fat. I found working with Julie made being in shape easy and I’ve been with her ever since! Now through the eyes of our 10 and 12 year old daughters I am healthy, physically, spiritually and mentally. They know I have goals and by doing my best every day I will reach them. They experience my discipline, but not obsessiveness. My girls don’t watch me step on a scale every day, because I only do so twice a month. They know Mom eats healthy but we also enjoy many meals out and weekly trips for ice cream. We celebrate a happy, healthy lifestyle. The crazy thing about being physically fit is the your self-esteem soars and it shows! The feeling is contagious and the impact reaches beyond my own family. Just as women have inspired me, I’m showing others it is possible at any age. If I can do it, they can too. All it takes is a first step and that can happen now! Looking For Inspiration & Motivation? Get the secrets that have helped 1,000's of FITBODY women change their lives & their bodies.